BRATISLAVA, Slovakia — For ZF Friedrichshafen CEO Stefan Sommer, launching a technology partnership with German automotive lighting and electronics supplier Hella was not going to become a complicated decision. In the arrangement announced last week, the companies made it clear that, despite the quest to jointly develop complex technologies for future vehicles, they are keeping their new relationship casual. "It's three sheets of paper," Sommer told Automotive News during an interview after the deal was announced here. "We didn't want long-lasting, legal discussions." The deal focuses on radar and camera technology critical to self-driving vehicles. According to Sommer, working it out took only about 10 weeks, starting with discussions through the German auto industry trade association VDA. A statement by Sommer and Rolf Breidenbach, CEO of Hella KGaA Hueck & Co., called their plan to develop new-generation automotive sensors "a strategic partnership" and "a non-exclusive cooperation." Sommer told Automotive News that this new business model was inspired by U.S. technology companies' fast-and-loose approach to collaboration. He calls it a "permanent transformation" of the automotive supply chain. "We are looking for economies of scale," Sommer said. "It makes no sense to do this in competition." Hella, a German supplier more than 100 years old, specializes in lighting and automotive electronics. While both companies have radar r&d underway, they differ in expertise and application. Hella focuses on short-range radar for side and rear functions such as blind-spot detection, while ZF has focused historically on forward-facing, mid-to-long range radar for adaptive cruise control and collision avoidance. Eyeing the increased competition among sensor providers because of the autonomous race, Hella executives spotted an advantage in packaging technology. "The system business will become more and more important," said Hella's Breidenbach. "With ZF, we can be cost-competitive." 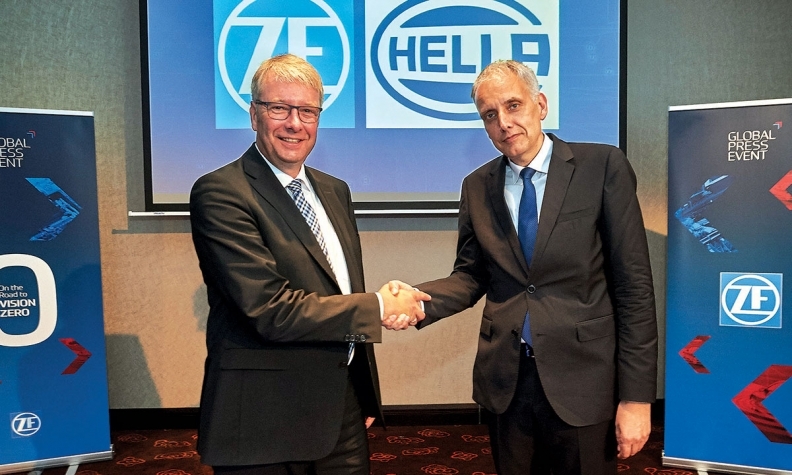 Taking advantage of ZF's global operations and customer base will also enable Hella to focus on building software services on top of its hardware, a potentially lucrative business, he said. For ZF, the partnership is part of a new pattern. The company has invested in radar company Astyx Communication & Sensors GmbH, lidar company Ibeo Automotive Systems GmbH, and vehicle networking company double-Slash Net-Business GmbH. ZF also has partnered with French interior supplier Faurecia and Nvidia, a U.S. chip supplier with expertise in artificial intelligence. "In Silicon Valley, they work like this," Sommer said. "Let's try that in this easy and open way as long as we can benefit from the cooperation." Rather than engaging Hella in a joint venture, or limiting the exchange to a simple customer relationship, ZF sees the deal as more of a mutual understanding to share development ideas, as the old-school driveline, transmission and chassis supplier tries to reinvent itself in an autonomous era. The effort to rethink its future as a global supplier began in 2015 with ZF's $12.4 billion acquisition of U.S. supplier TRW. ZF ranks No. 2 on the Automotive News list of the top 100 global suppliers with worldwide parts sales to automakers of $38.46 billion in 2016. Hella ranks No. 33, with estimated sales of $7.1 billion. The rapid engagements stem from an industry moving to an autonomous future faster than expected. Numerous carmakers and technology companies have targeted the early 2020s for use of self-driving vehicles, usually in the context of fleet-based operations. "All of our technology needs to be capable to serve Level 4 by 2020," said Sommer, referring to an autonomous standard that involves minimal human interaction. He is careful to keep the scope of the Hella deal broad. "It's all kind of solutions," he said of the arrangement. "The market is not that clear. It's safety systems, it can be assist systems, it can be autonomous driving systems, it can be interior camera systems.